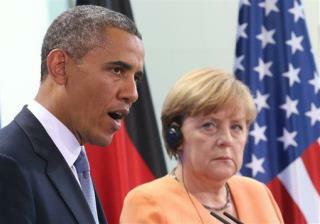 Merkel's conversations still could be occasionally overheard, though, point out the officials. That's because leaders who have been crossed off the NSA's list communicate with ones who remain on it. Officials say Obama was briefed on intelligence-gathering "priorities" but wasn't involved in choosing targets. "These decisions are made at NSA," one official says. "The president doesn't sign off on this stuff." That arrangement is now under review, however. The White House says it won't "comment publicly on every specific alleged intelligence activity," but the NSA issued a statement yesterday to deny a report that Obama had been briefed on the surveillance of Merkel back in 2010, reports the Guardian. A database entry in the Snowden documents suggests the surveillance began in 2002, well before she became chancellor. But German-American woes may be far from over: Der Spiegel claims that a spy outfit tied to the CIA and NSA has set up an illicit "listening station" atop the roof of the US Embassy in Berlin. Relying on documents leaked by Snowden, it reports that the "Special Collection Service" operates devices that can intercept everything from cell signals to satellite communications, and Der Spiegel believes those devices are possibly in operation behind "window-like indentations on the [embassy's] roof ... veneered with 'dielectric' material and are painted to blend into the surrounding masonry." The NSA had no comment. Cue Spanish outrage: El Mundo today claims that the NSA tracked more than 60 million phone calls in the country between December 2012 and January 2013. More on that story here. Has no business being president if he doesn't know what's going on. Should attend more briefings & less golf outings. I wonder if Obama would still get the Peace Prize. You know the one he got for what he was going to do. He didn't know the IRS was targeting certain organizations. He didn't know that the Obamacare website was a total failure. He didn't know his own staff was tapping the phones of those who trusted our government. What does he know? Seems less and less every day. Yet, no one can count the numbers of time he's said, "The buck stops here" as reported on CNN this morning. Obama has turned into nothing but a broken record. What a legacy he is creating for himself. His poor daughters will have to go through life knowing their father was an idiot.